Antique facetted rhinestones, natural rainbow rock crystals and tiny quartz clusters, 14k goldplated round beads and facetted crystal beads combine with creamy faux pearls all in a swoon over you and your loved ones. A gracious Valentine, wedding, anniversary or anytime loving gift! 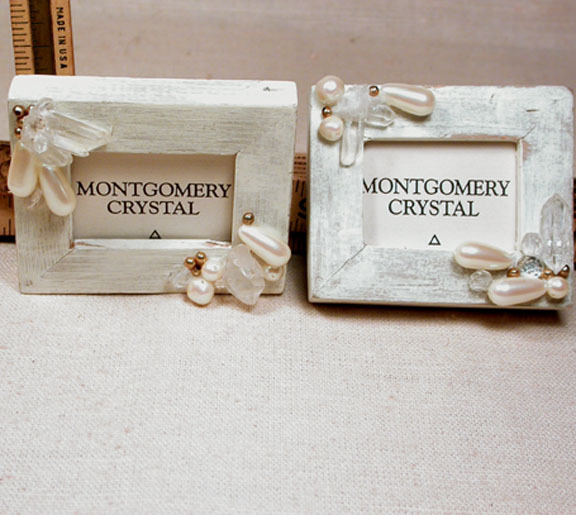 2-1/4 by 2-3/4" each, each one holds a precious 1-1/8 by 1- 3/4" memento under glass. They look just as dreamy standing vertically, too!